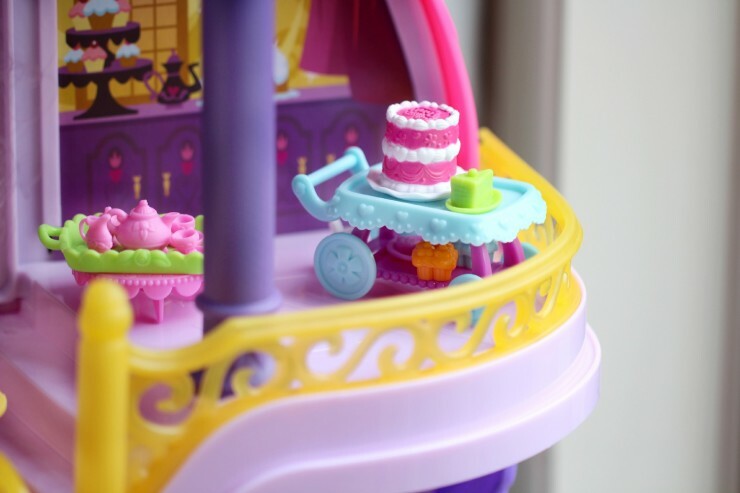 My Little Pony Cutie Mark Magic Canterlot Castle #FMEGifts2015 - Frugal Mom Eh! 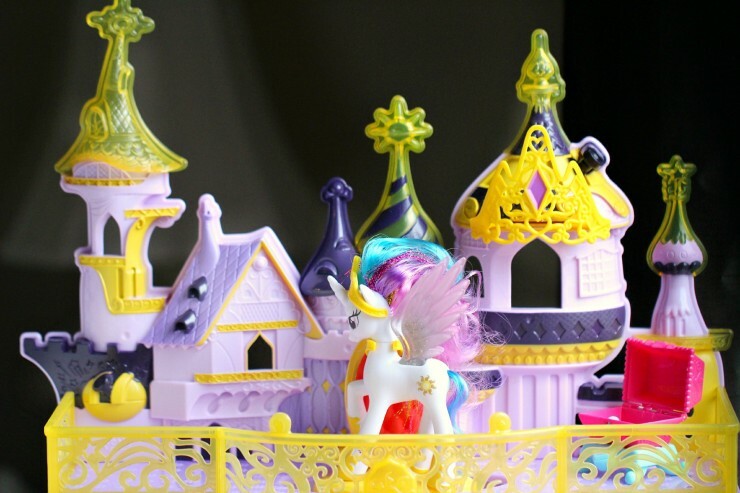 An item that is sure to be requested on many wish lists this year is the My Little Pony Canterlot Castle Playset. It is exactly the type of toy I would have loved to have received as a child. 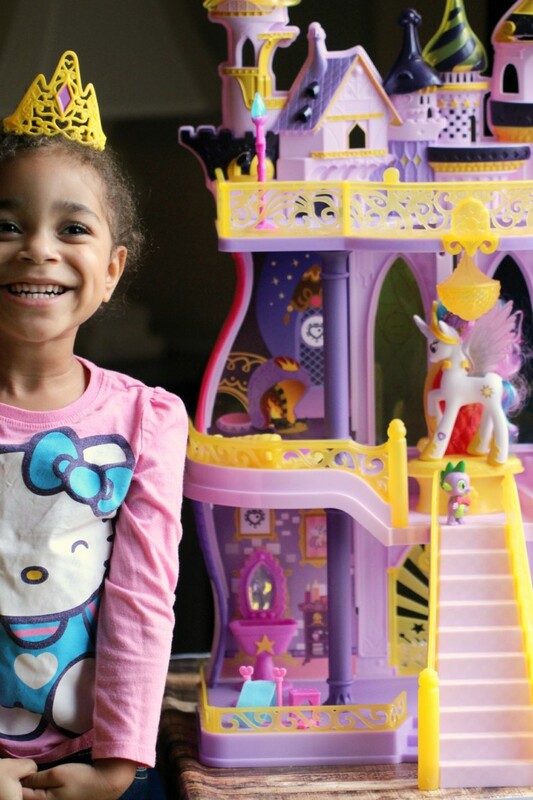 My Little Pony and a Castle playset? I don’t know about you, but I think this beats a doll house! 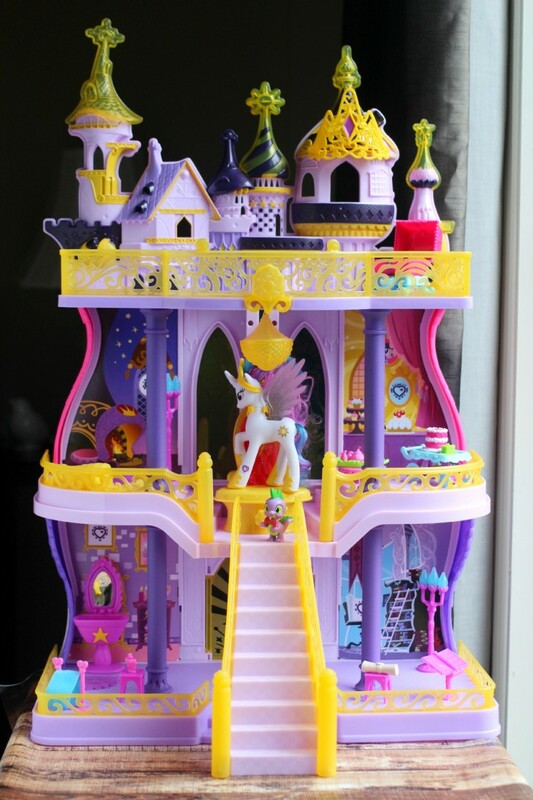 The My Little Pony Canterlot Castle Playset is three stories tall and has a working elevator to bring visiting ponies up to the third floor after trotting up the grand stairs to the throne. 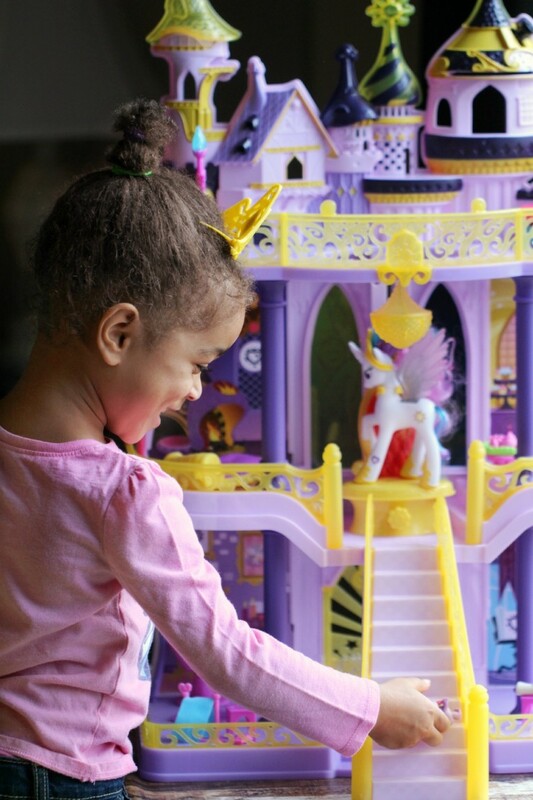 The My Little Pony Canterlot Castle Playset comes with furniture, decorations, and even tiny food so your child can setup the castle as they wish. It has everything you could ever want in a castle! The castle itself comes ready to assemble, it didn’t take very long to put together at all. I was a bit surprised by how much laminated cardboard makes up the playset and was worried it would be flimsy. Thankfully once put together it seems fairly sturdy and durable. We’ve had it for about a month now and the panels have not popped out of place nor has the castle fallen over. It does has some neat design features that I like including the doors at the back of the playset that open and close, and the stain “glass” inserts. Canterlot Castle is home to Princess Celestia and this magnificent castle comes with Princess Celestia herself and Spike the Dragon. 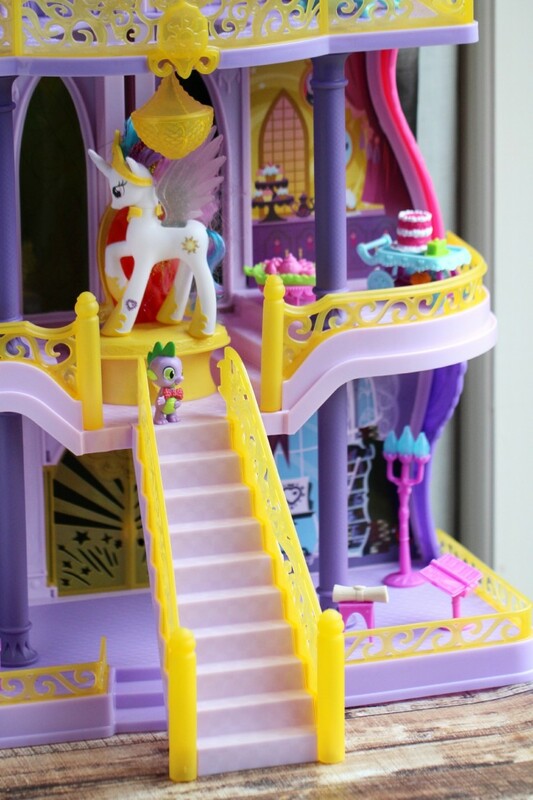 Little ones can explore this 3-level castle together from the first floor right up to the balcony with their own My Little Pony figures. Keira tends to play with about half the accessories on the floor in front of the castle so that there is more space in the castle itself to move the ponies around. 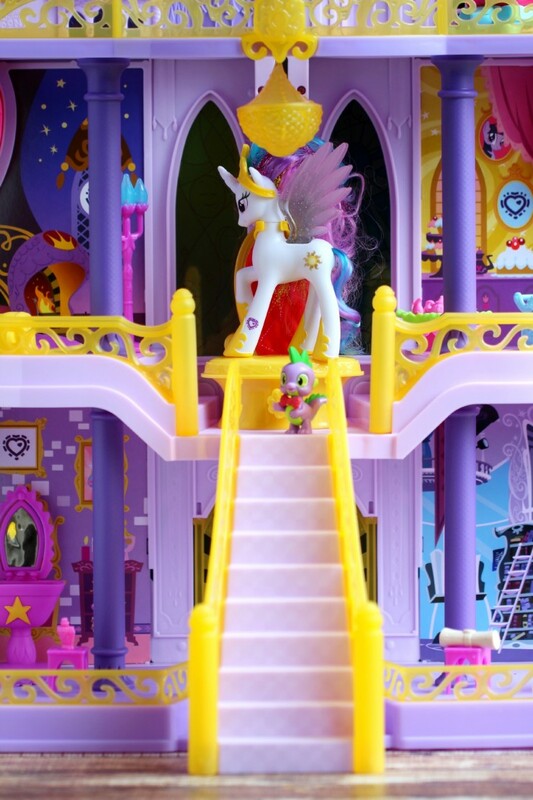 The staircase is removable which also makes it a bit easier to play with ponies inside the playset. 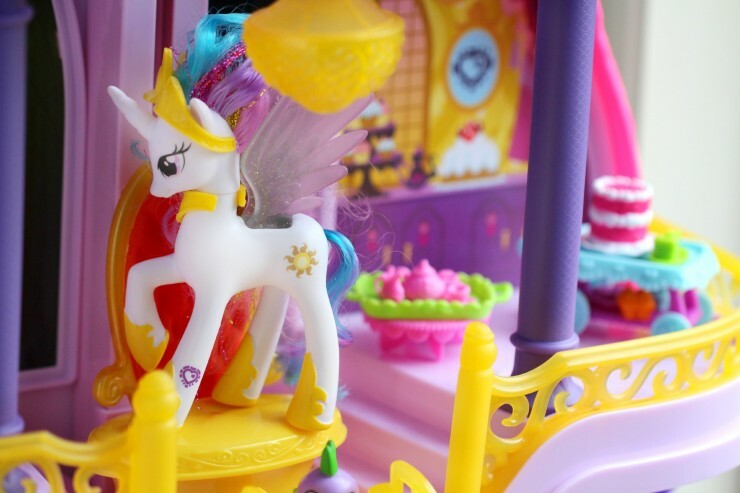 There are also codes hidden around Princess Celestia and Canterlot Castle that can be scanned to unlock more fun in the My Little Pony Friendship Celebration app. Kids can really let their imaginations go wild creating their own My Little Pony stories throughout the castle using their ponies and the included accessories. You can set the table for tea and treats or spend some time in the castle library reading through scrolls and practising magic. 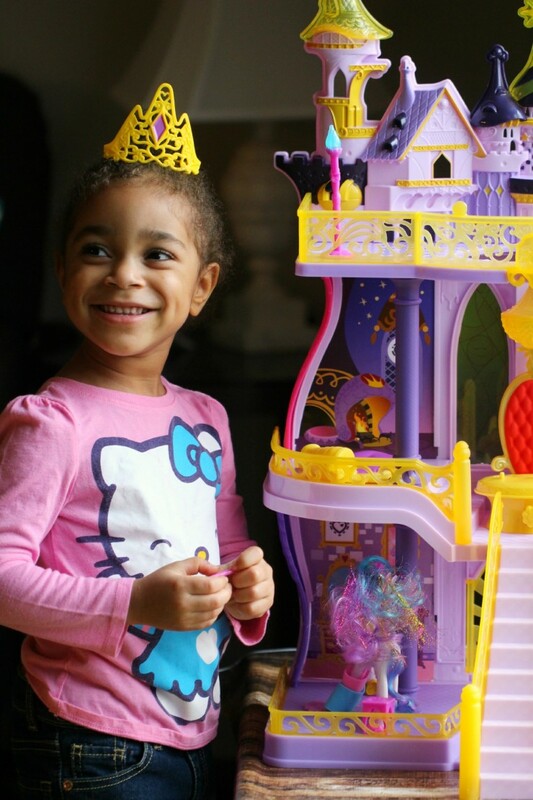 We discovered that the castle turret is actually removable and can be worn as a pretty tiara for princess dress-up. This is likely Keira’s favourite feature of the playset. 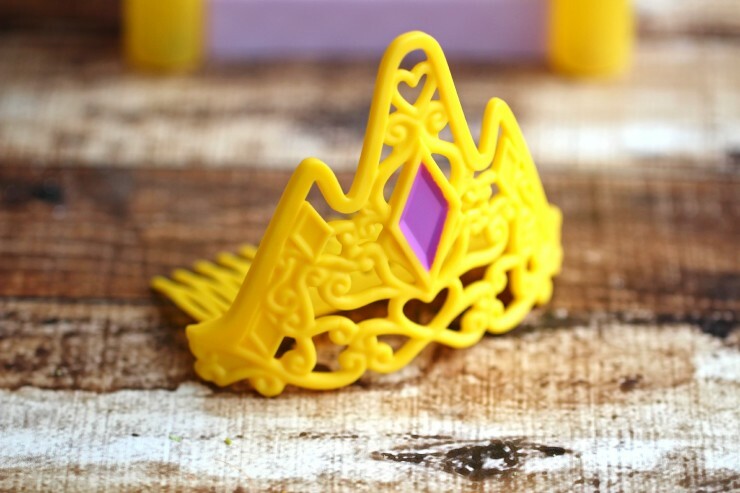 We ended up placing it in Keira’s room to prevent Ava from losing all the little pieces and that has worked out well as Keira now likes to get up in the morning and play with her My Little Pony’s in the castle. Thanks for the review on this product,it looks sturdy and very colorful,can see your little one is enjoying it. How fun, I have a MLP fan on my list that would love this! Thanks for the review! Oh my heart! I have a little girl who absolutely loves My Little Pony! She would die for this castle! How cute for little girls! My niece would love it. I remember My Little Pony from when I was young. It sure has come a long way since then. I love the castle and the tiara. That is so awesome! Seeing this reminds me of all the times I played with my doll house when I was a little girl. I remember these from when I was a kid. I know a few little girls that would love this for christmas. Wow that looks like a lot of fun. 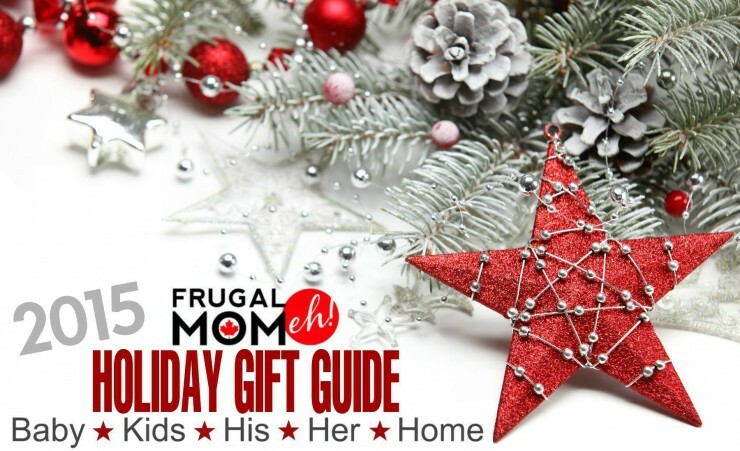 My girls used to love My Little Pony and my little niece does now, this would be a great gift! This is just a vision of purple and pink! My niece would go crazy for this. Oh my goodness! My daughter loves MLP! She would love this! 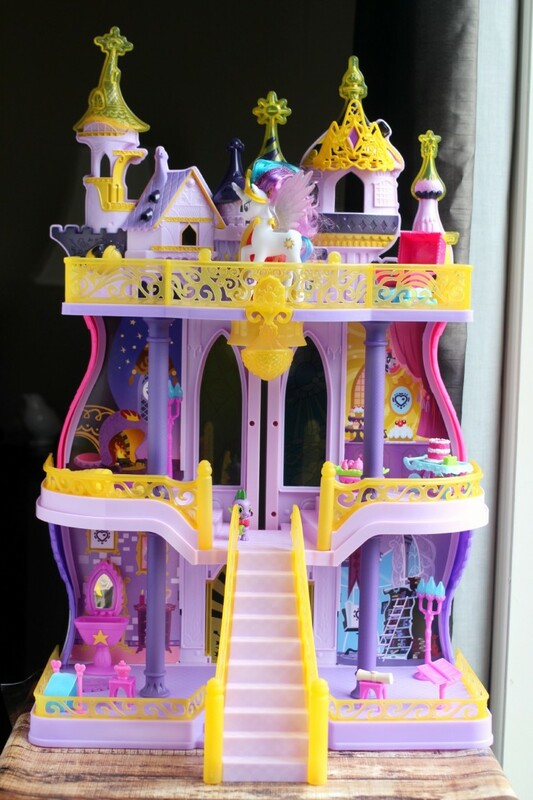 My kids would love the My Little Pony Canterlot Castle Playset. It would be a great Christmas gift. I know a few little girls that would love this for Christmas. I will have to pick one up for a special little girl i have in mind. This is such an adorable set. It’s so detailed! My Little Pony is such a cute show. My 3-year-old is sitting right next to me and just about lost her mind! Sounds like I need to check one of these out for christmas!! So fun! I love that My Little Ponies are still popular!! This looks like such a fun toy to play with! That looks like an awesome toy! My daughter has not gotten into My Little Pony yet, but I think it is not too far away from now. This will be great to get her when it happens! Oh wow, this is awesome. Twins are all about My Little Pony. They will flip out when they see this. My girls (who are triplets) are 18 now and we probably still have more than 100 My Little Ponies that they can’t let go of. 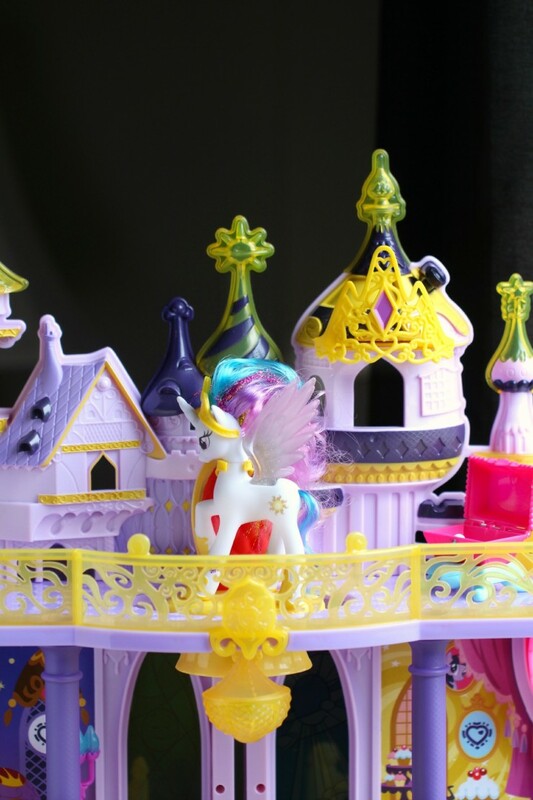 The MLP Magical Castle looks like a dream come true and I can’t imagine many little girls who wouldn’t want to find that under the Christmas tree this year. Super cute play set that my girls would be all over! I am thinking santa needs to bring one for my girls!